Bestway Cement Limited Chakwal-Farooqia Punjab. MBA (Finance) / ACCA / ACMA / CA (Part Qualified) 5 to 7 year's practical experience in accounting, budgeting. planning, Plant control forecasting and analysis. B.Sc. Mechanical Engineering / 8 Tech. Automobile / DAE Automobile 3/ 7/10 years practical experience in auto Eipenerxe in cement plant oral be preferred. DAE (Electrical) to 12 years practical experience in repair. maintenance of Electrical equipment in a cement plant. DAE (Mining) / Matric, 5/10 year, practical experience in limestone quarry mine sirdars certificate is mandatory for matriculation candidates. DAE Automobile / Matric / Under Matric 3/7/10 years practical experience of heavy.earth moving machinery in a consent plant. Matric / Under Matric 7/10 years practical experience related to Operation of heavy equipment HTV driving license is mandatory for Dumper Operators. Minimum BA/B Sc. with computer knowledge, 2 to 4 years relevant experience. Matric / Under Matric 4 to 6 years practical experience in repair and maintenance of light and heavy vehicles tyres. 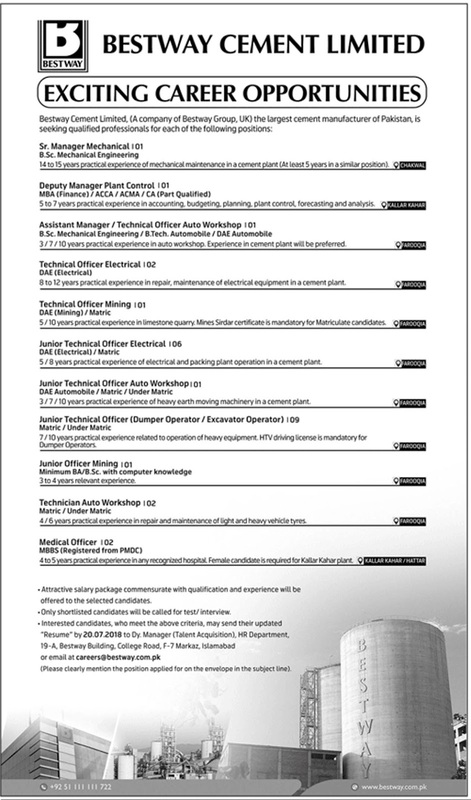 MBBS (Registered from PM&DC) 4 to 5 years of practical experience in any recognized hospital Female candidate a required for Kellar Kahar plant. • Attraction salary Package commensurate with Qualification and experience will be offered to the Wetted candidates. • Only shortlisted candidates will be called for test/ interview.